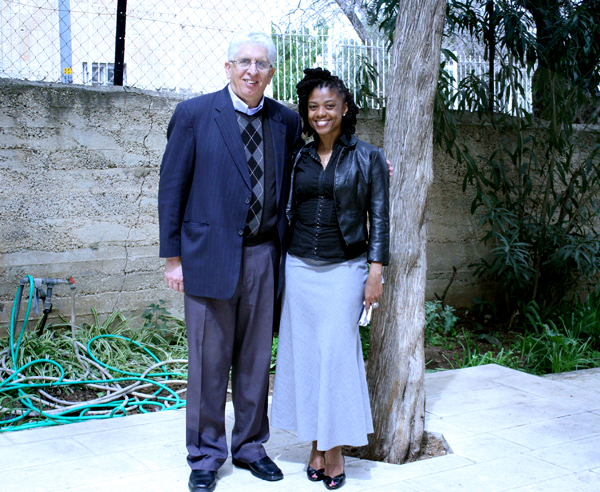 Me with Pastor Alex Awad outside of his East Jerusalem Baptist Church. Members of the Awad family were expelled from Israel. Growing up in the Caribbean in both Barbados and St. Vincent and the Grenadines, my friends and I played with sheer abandon on miles of forest green pastures. Be it a game of cricket, football (soccer), hopscotch, tug-of-war, “red light, green light” or “puss puss catch a corner,” we sometimes played from early morning till the golden sun sank beyond the horizons of our tranquil tropical shores. We ran through gullies reminiscent of orchards, where we climbed or “pelt(ed) trees” to fill our bellies with juicy fruits of the season. In the summer, we often soaked breadfruits in our crystal clear seawater then roasted them on the beach, sometimes gutting them to insert pigtails and when we took them charcoaled off the fire, we garnished them with locally-made Mello Kreem butter and washed down the delightful delicacy with some cool lemonade or freshly picked green coconut (water). We had our little tiffs too as children often do: like when I’d throw a pebble (or as we say in Barbados, a rock stone) at a boy for teasing me about being short or making fun of my name calling me, “Mosquito.” But never anything violent. Later, we’d all joke about it and all was forgiven. My friends and I were free to run in and out of each other’s homes, our respective parents feeding each child like their own. We were raised in a village, by a village. I cannot imagine nor would I wish for a more peaceful, happy and careFREE childhood. 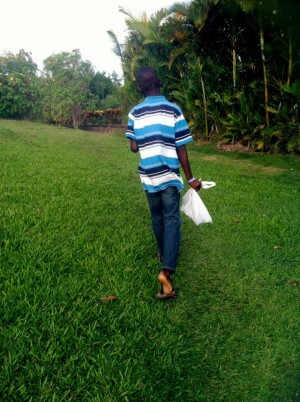 My 12-year-old nephew in Barbados walking along the peaceful village in which I grew up. On the contrary, just three years ago I set foot in the Middle East for the first time. I was there in my capacity as a tourist, as a pilgrim, but above all, as a journalist. One cool spring day, my fellow reporters and I made our way from Jerusalem to the West Bank after passing through checkpoints manned by the Israeli Defense Forces (IDF). We’d arrived in Hebron. After Gaza City, Hebron is the largest city in the Palestinian territories and home to hundreds of Jewish settlers. On these streets where almost every corner seemed to feature an Israel soldier, rifle in hand, the rules are that Palestinians walk on one side and Jews on the other. Palestinians aren’t allowed to cross the other side. We – visitors to the area had the freedom to walk on both sides. As we looked to our right, where the homes of Palestinians were stacked high together, we noticed, they were all fenced in, doors bolted and locked from the outside not allowing for exit to that side of the street. (Their only exit to the “streets” on which they could walk was via skillfully maneuvering across each other’s rooftops.) And each window was fitted with a barricade, with somewhat of an extended ledge and there in that area, we watched children at play– confined to those few square feet. As we caught the attention of their little faces and wondering eyes, the reality of their “captivity” hit me and I recalled my freedom on my island paradise at their age. I was moved to tears. My colleagues and I, appalled by all this, took photos, recorded videos and voiced our concerns about the ongoing Israeli-Palestinian conflict, about how many in our noble profession, especially the American media never paint such an account as we were experiencing. Soon it was lunch time and our group of about 20 was famished. The only place nearby to get sustenance was the quarters belonging to Jewish settlers. Otherwise, we had to send a Palestinian from a local store into the Palestinian living quarters−as we could not enter there−to get us some food. As visitors, we weren’t allowed to actually enter into their quarters, although we could roam the surrounding streets and even got a tour by a spokesman for the Jewish settlers of the Caves of the Patriarchs, also within that vicinity. We were told that the food was at least 15 minutes away and then a wait for the orders to be filled. We all looked at each other, looked toward the Jewish settlement and back at each other and decided, despite how hungry we were we could wait for food from the Palestinians. Religion has long been said to be the key issue in the Israeli-Palestinian conflict and many argue that the related issues: security; politics; human rights; and “territory” all stem from religion. Prior to my traveling throughout Israel and the West Bank, prior to sitting on a bus and having the fully armed IDF come aboard and inspect my credentials, prior to walking along the streets in East Jerusalem with my Muslim friend and fellow reporter in her hijab and having Israeli police stop us just because she appeared to be “Arab,” prior to meeting Palestinians whose families were thrown out of Israel or killed as a result of this ongoing conflict, prior to coming face to face with the separation wall that prevents Palestinians from entering Israel without authorization, prior to sitting in a room with and hearing and interviewing members of Hamas, prior to meeting with top religious leaders of various faiths in the Holy Land from Judaism to Christianity, Islam and Druze to The Bahá’í Faith to hear all sides of the story, I had a completely neutral stance on the Israeli-Palestinian conflict. To see all this first hand, to experience for only a few minutes what many Palestinians endure every day, is a shocking, sad feeling; which though I appreciate, I don’t wish ever to “endure” again. Moreover, the conditions we witnessed led me to believe that no child should grow up like this. And just like my friends and I were free to frolic on our Caribbean beaches, certainly, no child should meet such a tragic death as recently reported here in The New York Times of those four little boys killed while playing on a beach in Gaza. No matter what side you fall on, the reality is that the current state of affairs in Gaza, as well as overall between Israel and Palestine, is indeed cause for great concern. My stance now? NOW more than ever, there’s a need for a resolution—a PEACEFUL resolution. And soon. This is my prayer for Israelis and Palestinians at home and abroad. 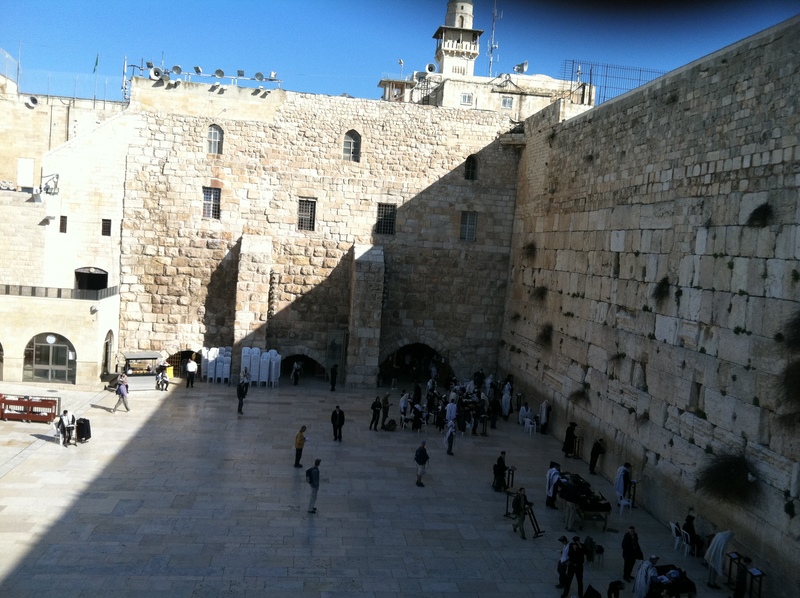 The Western Wall in the Old City of Jerusalem – one of the most sacred sites of the Jewish faith. My colleagues and I folded pieces of paper with our prayers and placed them here. Well written as always, Maquita. The opening paragraphs actually made me forget for a minute the title of the piece. But unfortunately, the rest of the post led me to what is a harsh reality for so many in that part of the world. The Isreali-Palestine conflict is so tragic, but I am not sure that we will see any solution in our lifetime. Still, where there is life, there is hope… too bad those four little boys have had all their hopes, and their families’ hopes for them, so meaninglessly obliterated. You’re so right, sadly it does seem like a solution is unlikely in our lifetime. But we can all continue to hope, pray, let our voices for peace be heard, do what we can toward accomplishing that peace and perhaps with some miracle the bloodshed and ongoing conflict will come to an end. As a fellow Barbadian who, has visited and for the past 4 years, lives in Israel I can say that things here are complicated….very complicated. I agree with your analysis of what you saw in Hebron: it is tragic what Palestinians suffer in their existence in the West Bank. I too can see why they would have animosity towards Israel: illegal settlers, restrictions on travel and economic prosperity. But, in the end there is a long history of inept leadership at play on both sides which has resulted in the current situation. I am eternally grateful for the likes of Errol Barrow and Erskine Sandiford. Leaders who saw a future for their people an made hard choices that benefited everyone. Unfortunately, this type of leadership is lacking the world over but in particular in this region. Everyone is worried about uplifting themselves and not the people they represent: that goes for both sides. Unfortunately also, the current conflict is actually a series of unfortunate events that culminated in a domino effect of sad and violent acts with tragic consequences, but I digress. There is no simple solution to this crisis, current or otherwise because of a simple human vice: pride(honor). Both cultures have a deep sense of pride/honor and cherish it dearly. Once the “pride or honor” of either people injured it is not easily repaired. What we are left with is a death match where both parties are hurting but neither will back down because an injury to their pride/honor is way more devastating than a out stretched hand for peace. I’m sorry to say that there will never be peace here until new leadership has risen that is truly willing to genuinely extend that prideless hand.